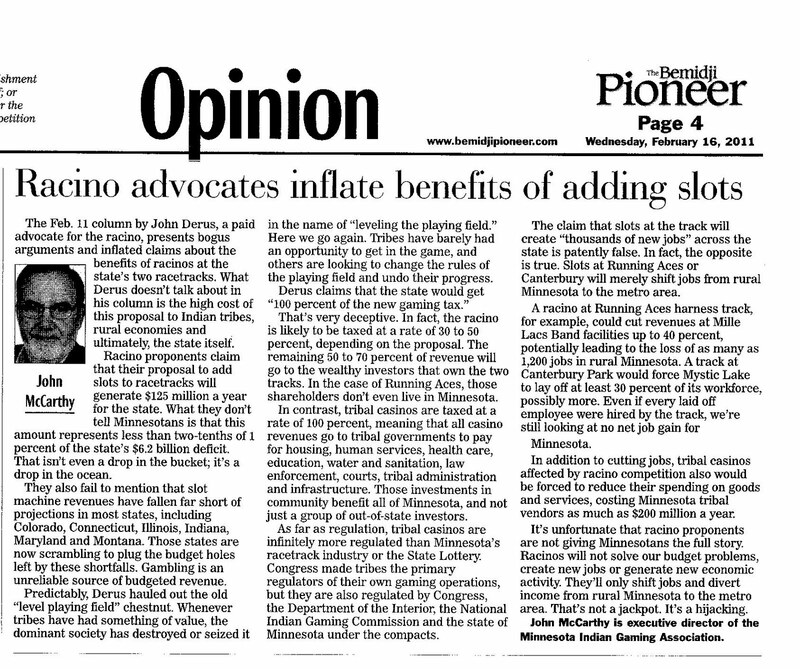 Racinos at Canterbury Park and Running Aces Harness Track offer no jackpot for Minnesota, says MIGA Executive Director John McCarthy in an opinion commentary published in today’s Bemidji Pioneer. 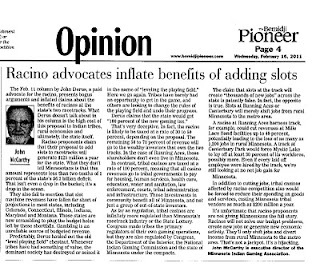 “The February 11 column by John Derus, a paid advocate for the racino, presents bogus arguments and inflated claims about the benefits of racinos at the state’s two racetracks. What Derus doesn’t talk about in his column is the high cost of this proposal to Indian tribes, rural economies and ultimately, the state itself. “Racino proponents claim that their proposal to add slots to racetracks will generate $125 million a year for the state. What they don’t tell Minnesotans is that this amount represents less than two-tenths of one percent of the state’s $6.2 billion deficit. That isn’t even a drop in the bucket; it’s a drop in the ocean. “They also fail to mention that slot machine revenues have fallen far short of projections in most states, including Colorado, Connecticut, Illinois, Indiana, Maryland, and Montana. Those states are now scrambling to plug the budget holes left by these shortfalls. Gambling is an unreliable source of budgeted revenue. “Predictably, Derus hauled out the old “level playing field” chestnut. Whenever tribes have had something of value, the dominant society has destroyed or seized it in the name of “leveling the playing field.” Here we go again. Tribes have barely had an opportunity to get in the game, and others are looking to change the rules of the playing field and undo their progress. “Derus claims that the state would get “100 percent of the new gaming tax.” That’s very deceptive. In fact, the racino is likely to be taxed at a rate of 30 to 50 percent, depending on the proposal. The remaining 50 to 70 percent of revenue will go to the wealthy investors that own the two tracks. In the case of Running Aces, those shareholders don’t even live in Minnesota. “In contrast, tribal casinos are taxed at a rate of 100 percent, meaning that all casino revenues go to tribal governments to pay for housing, human services, health care, education, water and sanitation, law enforcement, courts, tribal administration and infrastructure. Those investments in community benefit all of Minnesota, and not just a group of out-of-state investors. “As far as regulation, tribal casinos are infinitely more regulated than Minnesota’s racetrack industry or the state lottery. Congress made tribes the primary regulators of their own gaming operations, but they are also regulated by Congress, the Department of the Interior, the National Indian Gaming Commission and the State of Minnesota under the compacts. “The claim that slots at the track will create “thousands of new jobs” across the state is patently false. In fact, the opposite is true. Slots at Running Aces or Canterbury will merely shift jobs from rural Minnesota to the metro area. “A racino at Running Aces Harness track, for example, could cut revenues at Mille Lacs Band facilities up to 40 percent, potentially leading to the loss of as many as 1200 jobs in rural Minnesota. A track at Canterbury Park would force Mystic Lake to lay off at least 30 percent of its workforce, possibly more. Even if every laid off employee were hired by the track, we’re still looking at no net job gain for Minnesota. “In addition to cutting jobs, tribal casinos affected by racino competition also would be forced to reduce their spending on goods and services, costing Minnesota tribal vendors as much as $200 million a year.